The deadline is June 26, Gowdy said, but the department does accept applications until the last day of the semester. Students also need to make sure they turn in their transcripts and make sure they are finished with all their classes, she said. Gowdy said students who file to graduate this summer and meet degree requirements will be officially graduated. Students are not required to participate in commencement any semester. She said students also need to be aware of the graduation procedure when pursuing multiple degrees. Gowdy said she is unsure how many students will walk in the ceremony to be held May 7. She said the numbers might be higher than last summer when the college saw 144 students graduate. That number was down from the year before, she said. Greg Gardner, Academic Affairs vice-president, said graduation is something to look forward to. Graduation is one of the happiest days of the year for faculty and staff here at the college,” Gardner said. “It’s the completion of a journey they started several years ago. “It’s a proud moment for those who work here at the college,” Gardner said. Gowdy agrees with Gardner that graduation is the pinnacle of the college experience. “It makes us feel great to see all the graduating students who come through the office,” she said. This story was corrected June 22. 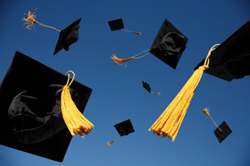 The Pioneer incorrectly reported about the graduation process in the June 18 issue.